A comparison of the European model(on the left) and American model(on the right), both showing a coastal low and cool/wet weather in South Jersey later next week. 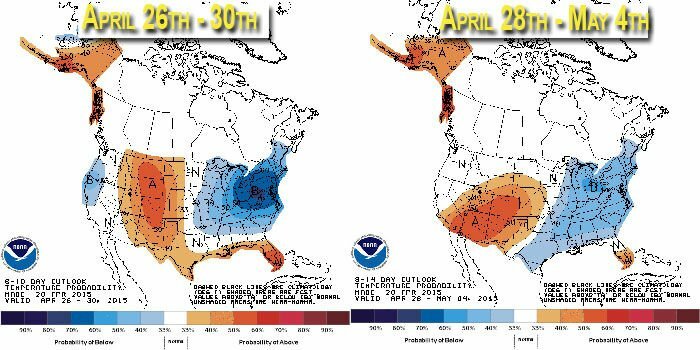 Cool weather looks to persist into early May across the eastern United States, including South Jersey. A cool stretch of weather ahead, perhaps a coastal low next week? Outside of a few showers or a thunderstorm later today, our forecast is a mainly dry one through the weekend and into early next week. In addition to dry however, cool is another main South Jersey weather theme through the next seven days. Our average high temperature for late April is in the mid 60s. And after seasonably mild temperatures today, the entire forecast is populated by highs around 55-60 , a solid 5-10 degrees below average. But while a cool and dry pattern takes up residence over South Jersey starting tomorrow and lasting through next Tuesday, a cool and wet one may be in our future towards the middle and end of next week. Most of our computer models, including both the GFS and EURO shown here, have been suggesting a mid-to-late week coastal low next week. While all models differ on the timing and the details, the main point is that they all show a storm. That increases the confidence that there will be a low pressure off the East Coast about 7-8 days from now. Now, the strength, track, and speed of any coastal low will determine just how wet we are in South Jersey. But some unsettled weather looks likely, at least where we stand from a week out. Things can and sometimes do change of course, so I’ll monitor trends as the next few days unfold. No matter how wet (or dry) we are, the cool temperatures will almost certainly continue, as a trough sets up over the Northeast U.S.. A trough is a dip in the jetstream, which steers our storms and acts as a thermostat, separating cold air to the north and warm air to the south. With a “dip” over us, that usually means cool and unsettled. That “dip”, or trough, was a constant feature this winter, hence the cold and stormy weather. Let’s hope it’s not a frequent feature on the map for the upcoming May, which does look cooler than average temperature-wise. Philadelphia did it Saturday. So did Trenton. Newark, too.